Our company has gained expertise in the field manufacture, supply, export and wholesale of Road Construction Material Trolley such as Single Tyre Trolley, Slab Trolley, ­­­­Double Wheal Harbana. These trolleys have high tensile strength and have outstanding technical specifications. In addition to this these are available at market leading prices. 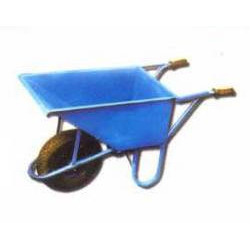 Our company is fast emerging as the leading manufacturer, supply, export and wholesale of Double Wheel Barrow. These are highly used for carrying materials and dust from place to place. Further these are equipped with quality material and are powerful. In addition to this, these have sturdy constructions. These are easy to handle and have high tensile strength. Last but not the least these are available at cost effective prices. Bucket: Prepared from 16 Guage. 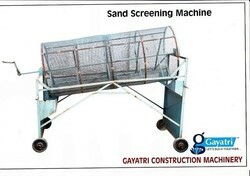 Stand: Two stands and two handles are provided for moving smoothly and for resting. Our company has gained expertise in the field of the manufacture, supply, export and wholesale of Single Wheel Trolley. These trollies are manufactured by 16 Gauge M.S. Sheet and consist of Angles Fitted with Single Scooter Tyre with Axle and Bearing. In addition to this these are equipped with two standles and handles to move these trolleys. These have high strength and are resistant to corrosion. Further, these are used to carry construction materials. 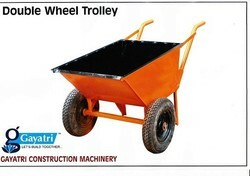 Looking for Road Construction Material Trolley ?